Maxo Strange is a GemX, the most perfect human ever made. Top in social class, in looks, in intelligence. . . until the day he wakes up and discovers a crack in his face. Repulsed and terrified, that crack starts him on a journey to places he hardly knows exist. Into the world of the Dreggies, the wretched underclass of imperfect people who live outside the Polis. Into the world of his father, the Polis’s chief scientist who ravaged human life to create the GemXs. And into the life of Gala and Stretch, Dreggies who ‘disappeared’ while volunteering for scientific research in the city. What none of them knows is that the research is still going on, because the city’s supreme leader has plans. Plans which will leave all of their lives hanging in the balance. A gripping, superbly written narrative of struggle and aspiration, faced by a monolithic Establishment and involving real moral choice, develops. Compelling and absorbing, this story underlines what a versatile, remarkable writer is Nicky Singer. 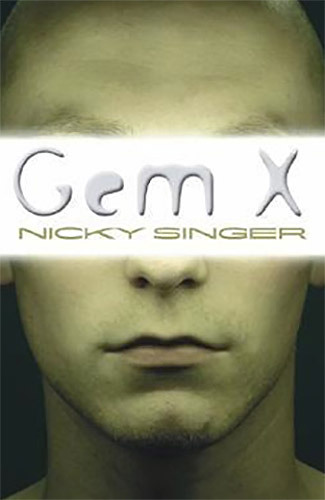 Nicky Singer is one of our best contemporary writers for teenagers, and GemX is a lot of fun to read. A brilliantly inspired plot and some terrific characterization.